Just like Final Fantasy IV, the first time I played Final Fantasy V was when I played the PS1 version, which was included, along with the PS1 port of Final Fantasy VI, in Final Fantasy Anthology. While Final Fantasy IV and Final Fantasy VI were released on the Super Nintendo (as Final Fantasy II and Final Fantasy III), the PS1 port of Final Fantasy V was the first time the game was officially released in North America. Although I didn’t think it was as good as Final Fantasy IV, I did enjoy playing Final Fantasy V and I thought that the jobs system was pretty interesting. I played through Final Fantasy V on my Playstation and I did make it to the final boss but unfortunately I just couldn’t beat it. I tried 15-20 times. Man, I remember being so frustrated. I had tried so hard to make it to the final boss but couldn’t beat it. This was back in the early 2000s. I ended up taking a break from Final Fantasy V, with the intention of going back to the game a few weeks later but I never did get back to the game. When a port of this game was released for the Game Boy Advance I picked up a copy from a local store. 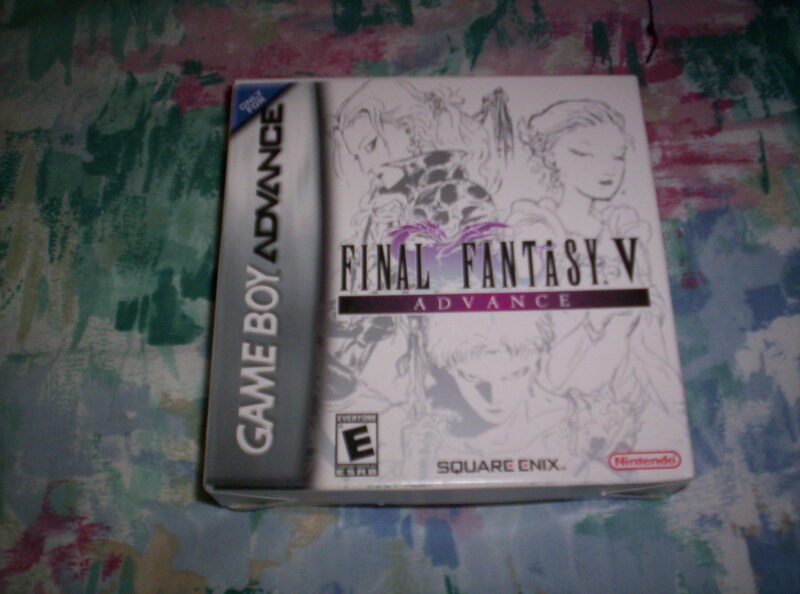 I played this GBA version of Final Fantasy V for about 3-4 hours but got sidetracked with other games. One day I do want to go back and finally beat Final Fantasy V. I’m not sure which version of the game I will end up playing but if it turns out to the GBA version then I won’t be too surprised. This entry was posted in Nintendo, Videogames and tagged Final Fantasy V, Final Fantasy V Advance, Final Fantasy V Advance Game Boy Advance, Final Fantasy V Advance GameBoyAdvance, Final Fantasy V Advance GBA, Final Fantasy V Game Boy Advance, Final Fantasy V GBA, Game Boy Advance, Game Boy Advance Games, GameBoyAdvance, GBA, GBA Games, My GBA Games, Nintendo, Nintendo Game Boy Advance, Nintendo Games, Nintendo GBA, video game, Video Games, Videogame, Videogames. Bookmark the permalink.